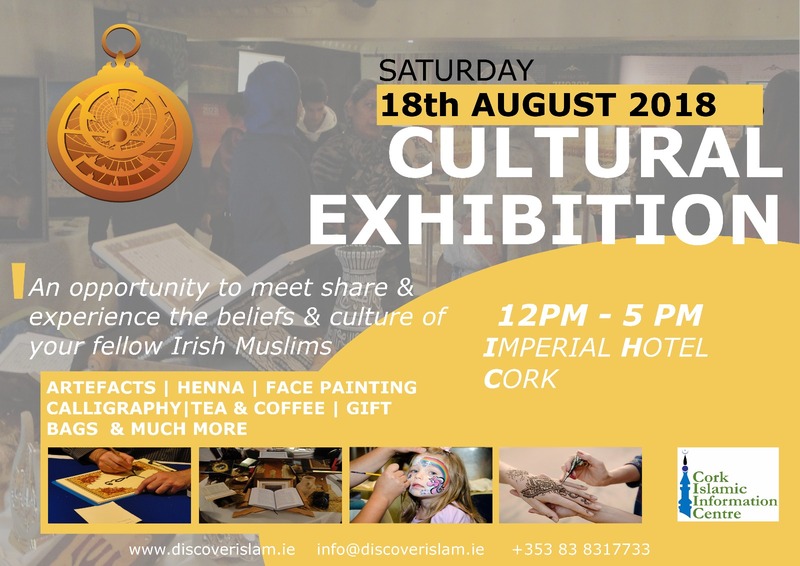 Cork Islamic Culture Exhibition 2018. An opportunity to meet, share, discuss and experience the principles and culture of fellow Irish Muslims. The objective of the Islamic Cultural Exhibition is to give the people of Cork an opportunity to come and see what Islam and Muslims are all about. This exhibition aims to be part of an integration process and we hope that we as Irish Muslims are not negatively blanket judged as portrayed in the media. This is also an opportunity for people to come and ask the questions that they may have regarding Islam and Muslims. The Islamic Cultural Exhibition will be complete with information, history, artworks, artifacts and literature about Islam and Muslims. There will also be short discussion forums where members of the public will be able to discuss and ask questions about Islam and Muslims. The exhibition will be completely free of charge with complimentary tea and coffee for all members of the public.